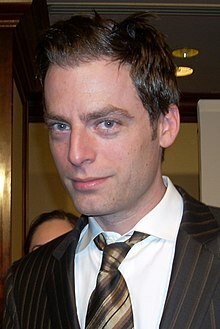 Justin Kirk (born May 28, 1969) is an American actor, known for portraying Prior Walter in Mike Nichols's acclaimed screen adaptation of Angels in America, for which he was nominated for the Primetime Emmy Award for Outstanding Supporting Actor in a Miniseries or a Movie. He is also known for his portrayal of Andy Botwin on the series Weeds. Kirk was born in Salem, Oregon. His mother was of Russian Jewish descent and his father was of Danish and English ancestry. Kirk grew up in Union, Washington, where he attended a grade school on a Native American reservation, until his family moved to Minneapolis, Minnesota, when he was 12 years old. He attended high school there and performed at Children's Theatre Company. He moved to New York City after graduating. Kirk played guitar in several New York bands in the early 1990s, most notably The Dimestore Darlings. He completed a two-year conservatory acting program at Circle in the Square Theatre School. His first role on Broadway was a play called Any Given Day, which was performed at the Longacre Theatre. He appeared in Love! Valour! Compassion! both in the film and in the original stage version – for which he received an Obie Award for Distinguished Performance in the Ensemble. He also appeared in Other Desert Cities with Stockard Channing, Judith Light, and Stacy Keach. He won a Backstage West Garland Award for Outstanding Performance for his role as a piano prodigy in Old Wicked Songs, staged at New York's Promenade Theater and Los Angeles' Geffen Playhouse. Kirk's other films include Flannel Pajamas, Chapter Zero, The Eden Myth, Puccini for Beginners, and Call o' the Glen. He made his television series debut in Jack & Jill. He starred as Andy Botwin on the Showtime television series Weeds alongside former Angels in America co-star Mary-Louise Parker. In 2017 Kirk starred in the procedural drama APB, which was cancelled by Fox after its first season. 2010 See You in September A.J. 1995 New York News Unknown Episode: "You Thought the Pope Was Something"
1998 The Pretender Horace Strickland Episode: "Hazards"
2001 Law & Order: Special Victims Unit Eric Plummer Episode: "Wrath"
2005 CSI: Crime Scene Investigation Patrick Bromley Episode: "Spark of Life"
2005 Jack & Bobby John McCallister Episode: "Under the Influence"
2005 Without a Trace Thomas Beale Episode: "Lost Time"
2006 Everwood James Carmody Episode: "Enjoy the Ride"
2013 The Blacklist Nathaniel Wolff Episode: "General Ludd"
2015 American Dad! Ax Jenkins Voice role; episode: "My Affair Lady"
2016 The Crossroads of History Leonardo da Vinci Episode: "Mona Lisa"
2018 Overthinking with Kat & June David Episode:" The Icebreaker Cometh"
^ a b c Baker, Jeff (April 30, 2014). "17 actors you (maybe) didn't know were from Oregon". The Oregonian. Portland, Oregon. Retrieved February 16, 2016. ^ Jacobs, Alexandra (December 7, 2003). "TELEVISION; When It Comes to TV Angels, He's Batting .500". The New York Times. Retrieved February 8, 2017. ^ "Dimestore Darlings, 9-9-09 Dimestore Darlings: Rock Band". Dimestoredarlings.tumblr.com. 1996-10-12. Retrieved 2012-08-28. ^ Rice, Lynette. "APB is Dead at Fox". Entertainment Weekly. Time Inc. Retrieved 12 May 2017.